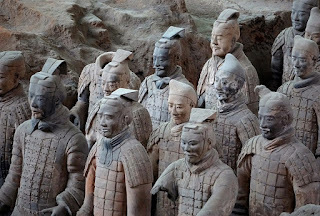 The Terracotta Warriors are a set of more than 8,000 figures of warriors and life-size terracotta horses, which were buried near the self-proclaimed first emperor of China of the Qin Dynasty, Qin Shi Huang. They were discovered during works for a water supply in March 1974 near Xi'an (Shaanxi Province, People's Republic of China). Since 1987 they are considered as World Heritage by Unesco. They are inside the Qin Shi Huang MausoleumBurying these statues it was believed that the emperor would still have troops under his command. The terracotta army was buried in battle formation in three trenches, one kilometer and a half east of the emperor's tomb, which in turn is 33 km east of Xi'an. The three pits are between 4 and 8 meters deep. They have been excavated and a hangar has been built in the ruins, called the Army of Warriors Museum. The Chinese government's demand to the US authorities is a severe punishment after a man stole a thumb of a terracotta warrior that was being exhibited in the United States.The 2,000-year-old statue, valued at US $ 4.5 million, is part of a loan of a set of 10 figures to the Franklin Institute in Philadelphia, USA.Last week, the man, identified as Michael Rohana, was accused of stealing and hiding his finger, although he was released on bail.The army of terracotta warriors is one of the most important archaeological finds in China. According to court documents, Rohana, 24, attended the "Ugly Sweater Party" that was taking place at the Franklin Institute on December 21, when she managed to enter the room where the warriors were being exhibited. According to the Chinese state agency Xinhua, the young man used a mobile phone as a flashlight and took a selfie with one of the warriors. Then, he supposedly put his hand on the left hand of the statue and something broke. He put the piece in his pocket and left. The staff of the museum noticed the disappearance of the thumb just on January 8 and the FBI investigated what happened and came to Rohana, who admitted that he had kept his thumb in the drawer of a desk in his house. On Monday, the director of the Shaanxi Cultural Heritage Promotion Center, the government organization that lent the statues, strongly condemned the Franklin Institute for being "careless" with the statues. Wu said the center would send two experts to the United States. to evaluate the damage and repair the statue with the thumb recovered. There will also be a claim for compensation. The Franklin Institute held the contracted security company responsible because it did not follow the closing procedures on the nights when there are events and said that after the incident the security protocols were reviewed and the necessary measures were taken, as confirmed by the publication of the newspaper The Courier-Post. The 10 statues currently on display at the Franklin Institute are part of a set of 8,000 life-sized clay warriors that make up the Terracotta Army. The statues were constructed during the mandate of the Chinese emperor Qin Shi Huang, who died in 210 BC, and who believed that he would be protected in the afterlife.